IEC 60601-2-5:2009 applies to the basic safety and essential performance of ultrasonic physiotherapy equipment employing a single plane unfocused circular transducer per treatment head, producing static beams perpendicular to the face of the treatment head. This standard can also be applied to ultrasonic physiotherapy equipment used for compensation or alleviation of disease, injury or disability. This third edition cancels and replaces the second edition published in 2000. This edition constitutes a technical revision. The numbering was revised to agree with IEC 60601-1:2005 (third edition). Beyond this, essential performance characteristics are defined in 201.4.3.101, guidance on maintenance is added in 201.7.9.2.1, a new requirement regarding dielectric withstand was added in 201.8.8.3. The clause on transducer surface temperature rise, 201.11, has been modified to allow for simulated use conditions. 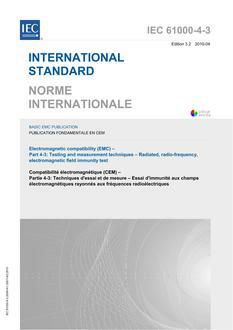 Measurements of ultrasound-related parameters are now referenced to IEC 61689:2007 (second edition). The most important change in the ultrasound-related parameters is the definition of effective radiating area, 201.3.207. This change will also affect the value of the effective intensity and its uncertainty.